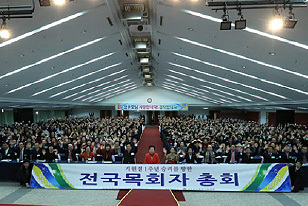 True Mother visited to meet approximately 700 participants (basically pastors' couples) of the assembly, which was held at Yong Pyeong Resort from Nov. 20 to 22. 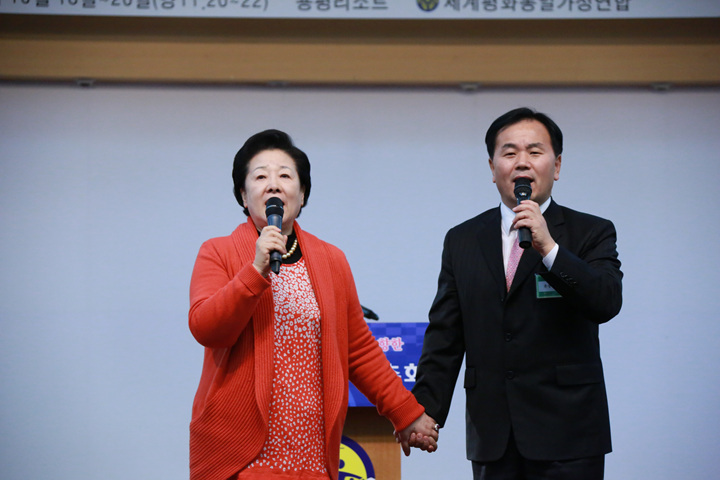 In her message, True Mother said, "As nature responds to Jeon Seong and love, without fail, I hope you too will respond to True Parents' expectations and love." True Mother explained her family history centering on her grandmother, Mrs. Won Mo Cho. 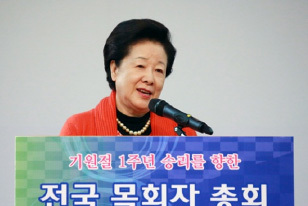 Emphasizing that God had prepared various foundations to send True Parents, she asked "I hope you will become the pastors who can stand in the central position in this new era of history, that is, the era of Cheon Il Guk." True Mother said that before she came to the assembly, True Father had appeared in her dream and told her to give pumpkin yeot (Korean hard taffy) to them. Then she said, "I came here to Yong Pyeong, hoping that by being reborn through repenting (how much you couldn't accomplish your responsibility as of now), you will make a new start and establish ideal families that will last eternally in the era of Cheon Il Guk." True Mother said, "The more you offer your Jeong Seong for the sake of Heaven, the more Heaven returns to you by multiplying it. So please make your utmost efforts." After the songs by some of the participants, True Mother sang "사랑해 당신을" (I love you) together with Rev. Kyeong Seok Yoo (president of Korean FFWPU) holding his hand. Finally, while leaving, True Mother said, "The more you do witnessing, the richer you become."